If you’re finding yourself spending a lot of money on snacks and hating the long list of ingredients they’re made with, it’s time to make your own healthy snacks. The snack market now compared to how it was 10 years ago is drastically different. It’s much easier to find clean labels and products with minimal ingredients. Yet the best ones tend to also be pricey because of the quality of ingredients. 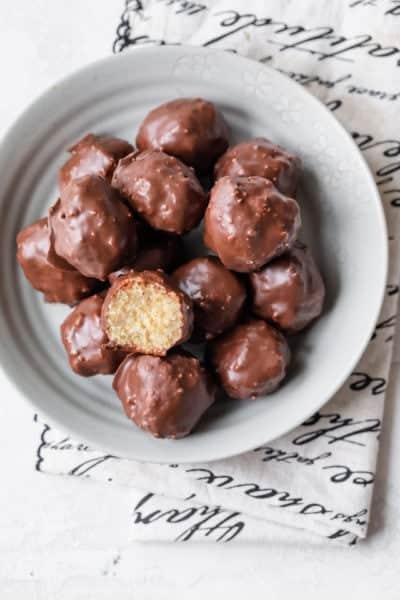 One snack you can easily make at home though is these no bake energy bites. There are so many variations of this snack all over now. They’re called energy bites, fat balls, protein bites, and countless other names. One thing that’s consistent though is how healthy they are for you! It’s a great snack made with wholesome and feel good ingredients. And in the case of my recipe, it’s literally two ingredients that are so good for your body. Pecans: Like many nuts, pecans are loaded in unsaturated fats that are also known as good fats. That have no cholesterol and no trans-fat and that can protect you from heart disease. Aside from the heart benefits (it is February Heart Health Month after all), pecans are a plant-based protein. They have 3g of protein in every 1 ounce. And that protein is going to help boost your energy! Dates: While dates are basically dried fruit and relatively high in sugar, they are a naturally sweetener. So they offer a great way to add sweetness without any sugar. Because they are high in fiber, they slow down your digestion and help prevent blood sugar levels from spiking too high. That means you get a sweet treat that gives you lasting energy, not a sugar rush. Start by pitting 10-12 dates and then soaking them in warm water. This helps soften the dates so they blend much easier with the pecans. If the dates are super fresh and soft, you can probably skip this step. Add the dates and pecans to a food processor, and add a pinch of salt which helps offset the sweetness of the dates. I use raw pecans, but toasted ones are fine too. And I prefer medjool dates since they are large and soft (and pretty accessible). But other varieties work as well. When you blend the dates and pecans, you’ll want to look for a sticky dough like mixture. Then, use your hands to scoop out about 1-2 tablespoons of the mixture into your hands and roll them into a small energy balls. You can set them in the fridge for 20 minutes while cleaning out the food processor. You can actually enjoy these energy balls right after they set in the fridge as is. But I like to roll them in dessicated coconuts to make them a complete treat. I haven’t met anyone who doesn’t like these no bake energy bites! And they are such an easy snack you can make a couple times a month. Change them up and keep on hand to nibble on in between meals. It’s healthy, easy-to-make and absolutely delicious! My recipe includes only 2 ingredients. But there are so many ways to customize energy balls to make them work for you. 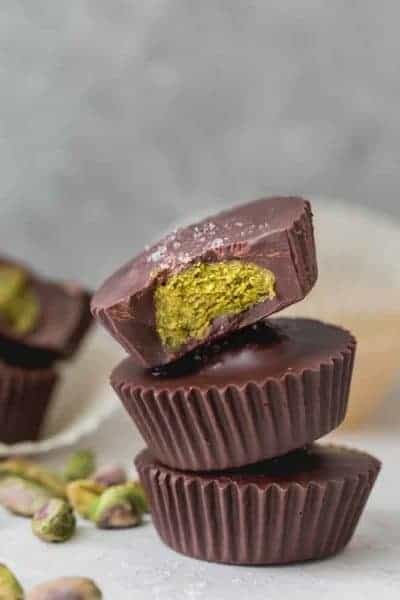 Seeds: Chia seeds, flax, hemp seeds, sunflower seeds and pumpkin seeds give the energy bites more plant-based protein and give them an extra crunch. If you’re adding seeds, I would recommend 2-3 tablespoons. Nuts or nut butters: Use roughly chopped nuts or nut butter. Regardless, this is another way to add healthy fats, flavor and protein to the energy bites. If you’re adding a nut butter, you’ll need to add some dry ingredients to off-set it, like oats, almond meal, protein powder or powdered peanut butter. For every 1/4 cup of nut butter, use 1 cup of dry ingredients. Dried fruit: Although there’s already dates in the energy balls, you can also add raisins, apricots, coconut or cranberries. I would recommend chopping them up finely or blending in the food processor. And if you are adding more dried fruit, it helps to balance out the sweetness with something salty or bland like more nuts, oat, almond meal or unsweetened protein powder. Spices: To add more flavor, I love throwing in cinnamon, or other warm spices like nutmeg, ginger, cardamom, turmeric or cloves. A lot of these spices have anti-inflammatory properties too so you’ll get a healthy dose of that in your energy bites! Sweet surprises: Hello chocolate chips and chocolate chunks! These make the energy bites more fun and sweet – perfect for kids. You can also add white chocolate chips, butterscotch chips or even toffee pieces. This is one of those recipes that you can totally experiment with to add ingredients, taste and test to get a mixture you love. If the mixture is too dry and it’s not rolling into a ball easily, then add more sticky ingredients like dates, nut butters or honey/maple syrup. If the mixture is too wet and gooey, then add more oats, almond meal or protein powder. I hope you make this homemade healthy snack that’s full of feel good natural ingredients. And I hope it gives you energy to tackle your day with a pep in your step! Have fun with the recipe and customize it to your liking! If you’ve tried this healthy-ish feel good No Bake Energy Bites recipe or any other recipe on FeelGoodFoodie, then don’t forget to rate the recipe and leave me a comment below! I would love to hear about your experience making it. And if you snapped some shots of it, share it with me on Instagram so I can repost on my stories! Place the pitted dates and pecans in the bowl of a large food processor. Blend on high until a thick “dough” is formed and the mixture feels sticky. Roll the energy bites into dessicated coconut pressing gently so they adhere. Makes about 24 bites. Storage: Store any leftovers in an airtight container. They will last about 10-14 days in the fridge. Sourcing: You can find the Medjool dates at Middle Eastern markets, natural-foods stores or even in large supermarkets, often located with other Middle Eastern ingredients or sometimes with the raisins and dried fruits. Substitutes: For best results, follow the recipe as is. However if you don't like pecans, you can substitute almonds, walnuts or other nuts. Nutrition: Please note that the nutrition label provided is an estimate based on an online nutrition calculator. It will vary based on the specific ingredients you use. This information should not be considered a substitute for a professional nutritionist’s advice. The nutrition value is for two energy bites assuming the dough is divided into 24 parts. Yes. 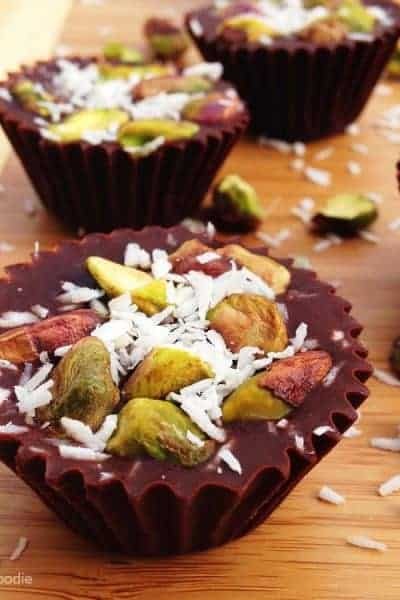 Surprisingly only little energy required to make these sweet and nutritious energy bites. Love dates & pecans. I made a batch and am enjoying every bite of it.